The Fellowship was fortunate enough to obtain a copy of CONAN THE SLAYER #1 from Dark Horse Comics. Cullen Bunn writes, Sergio Davila draws, Michael Atiyeh colors, and Comicraft letters. Conan walks alone through the desert, bleeding from many wounds. His men have been slaughtered, and those who did it follow him still. But the Cimmerian is not done yet, and when the hunters catch him, they regret it quickly. And onward Conan walks, until he passes out before a Kozak camp. Their leader is intrigued by Conan, and takes a liking to him for some reason. It seems that Conan is a bit of a hot property these days. He’s been consistently in print, between original stories and Howard adaptations, for a good long time. 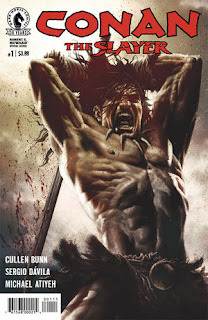 And now Cullen Bunn is getting a crack at the Cimmerian, which is a good thing. This story has that Conan feel to it, and it looks amazing on the page, with plenty of great action scenes and gory detail. I admit it – I’m a sucker for dark tales of fantasy and bloodshed. This Conan is all of that and more, and to that I say Long Live Conan! CONAN THE SLAYER #1 is available now at your FLCS or at darkhorse.com.